Wonder no longer. The new Financial Reform Bill is positive for preferred stock investors in two specific ways. First, if you own or purchase the right bank-issued preferred stocks over the next two years (starting right now), the Collins Amendment to the bill all but guarantees that you are in for a nice capital gain on top of the above-average dividend income that you will be earning from your shares in the meantime. Secondly, the bill motivates our Big Banks to not just retire ("call") some of their existing preferred stocks as their respective call dates arrive (a "call" is when the bank buys your shares back from you for $25.00 per share), but also replace them with a large crop of new preferred stock issues. I'll get to the details in a moment but, for preferred stock investors, the Financial Reform Bill should provide those who own shares of specific bank-issued preferred stocks with (1) above-average dividend income for at least the next two years, (2) a nice capital gain once the call date arrives plus (3) a menu of brand new preferred stocks to pick from. There's a second piece of news that I wanted to bring to you this month as well. A Wall Street Journal analysis concludes that, for the next two years, Real Estate Investment Trust companies (REITs) are going to be issuing a flood of new, high quality preferred stocks onto the market. This lines up very nicely with the timeframe provisions stated within the new Financial Reform Bill. If the Wall Street Journal has it right, preferred stock investors are going to be enjoying a wave of new preferred stocks from REITs for the next two years followed immediately by a second wave of new high quality issues from banks courtesy of the Financial Reform Bill. What a great coincidence for preferred stock investors! Here's how this should play out over the next several years. 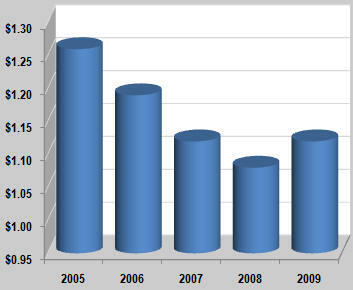 During the last real estate boom (2005/2006), REITs introduced a large volume of corporate bonds (about $27 billion). Many of these bonds carry five year maturities and will start coming due soon. A May 26, 2010 Wall Street Journal article titled "For Some REITs, Payout Date Looms" makes the case that REITs, very anxious to reduce debt, are likely to be issuing new preferred stocks shortly in order to raise the capital needed to retire these boom-era bonds. Supporting this point of view is that fact that, while high quality preferred stock dividend rates have now been restored to pre-crisis levels, the federal funds rate, which corporate bond interest rates are more closely tied to, is still artificially low. The theory being that as the Federal Reserve begins to raise the federal funds rate (which we all know they will have to do since the current rate is essentially zero), corporate bond rates are likely to go up while preferred stock dividend rates may stay unchanged, at least for some period of time. 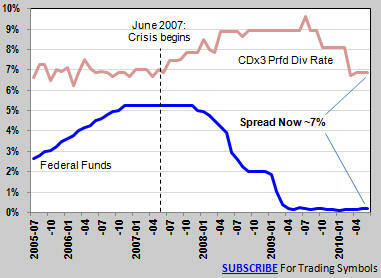 Historically, the spread between the federal funds rate and high quality preferred stock dividend rates runs between 2% and 5%; right now the spread is at 7%, further suggesting that there is room for the federal funds rate and corporate bond rates to rise before we see an increase in preferred stock dividend rates (see Figure 1). If corporate bond interest rates come up, while high quality preferred stock dividend rates stay flat, the WSJ article could very well prove to be correct. We would see fewer corporate bonds and more new preferred stocks used to generate the capital needed to pay off maturing boom-era REIT debt. While during the Global Credit Crisis it was banks that were issuing the bulk of the highest quality preferred stocks (all the way up to 9.6%), it could very well be REITs that lead the next wave of new high quality preferred stock issues. 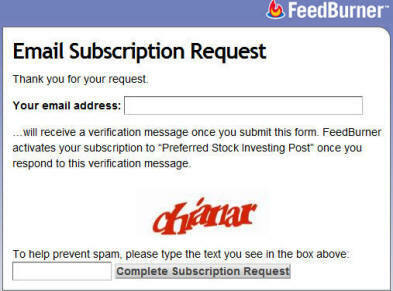 Subscribers to the CDx3 Notification Service (my email alert and preferred stock newsletter research service) receive an automatic email alert whenever a new "CDx3 Preferred Stock" (see sidebar at the top of this newsletter) is about to be introduced. Don't be left out. On the heels of the REIT wave, the new Financial Reform Bill ushers in the second wave of new preferred stock issues, but this second wave will come from banks (with over $15 billion in assets). While there can always be exceptions and changes downstream, here's how this should work. There are three types of preferred stocks - traditional preferred stock, Trust Preferred Stock (TRUPS) and third-party Trust Preferred Stock (see Preferred Stock Investing, chapter 2). For the reasons explained in my October 1, 2009 blog article titled “Trust Preferred Stocks - Why Not Just Issue A Bond?”, most preferred stocks issued by banks over the last several years are TRUPS. The Collins Amendment should result in many banks replacing their TRUPS with traditional preferred stocks, beginning two years from now. Banks are required to keep a certain amount of capital in reserve to cover the bank’s risk (such as the likelihood that borrowers will default on their loan payments). Regulators use a variety of metrics, referred to as capital ratios, to measure how much capital a bank has on hand (as a percentage of its total assets). One such capital ratio is called "Tier 1 Capital" and includes the bank’s equity (common stock as well as preferred stock) but not the bank’s debt (such as bonds issued by the bank). Currently, TRUPS are considered by regulators as a type of preferred stock (equity) so the value of a bank’s TRUPS counts in the Tier 1 Capital calculation. By issuing a TRUPS, a bank is therefore able to boost its Tier 1 Capital. Almost all of our Big Banks have several TRUPS issues currently trading on the stock market. Here's the trigger: Under the Collins Amendment, however, the value of a bank's TRUPS will no longer be able to be included in the calculation of Tier 1 Capital. There is a five-year transition period. The disallowance period kicks in two years from now (mid-2012) and gives banks three years to replace their TRUPS. Most banks should do so by calling (buying back from then-current shareholders) their TRUPS shares as they reach their respective call dates. Remember, if you hold shares of one of these TRUPS when the bank calls it, you are going to receive $25.00 per share that you own, regardless of the then-current market price and regardless of your original purchase price. $25 per share; that's what you are going to get in the event of a call. Now here's where this gets really interesting for preferred stock investors. Capital Gain Enter Here: Many of the affected bank-issued TRUPS are currently selling for a market price below $25 per share. When a TRUPS is eventually called by its issuing bank, investors who purchased their shares for less than $25 will receive a nice capital gain, on top of the great dividend income that their shares will earn in the meantime. And the great thing is that, sitting here today, we can identify the specific bank-issued TRUPS that are going to be affected and see which ones are currently selling for less than $25 per share. Issues that have already exceeded their call dates, but are still trading, should be among the first to be called two years from now. Using the catalog of the highest quality preferred stocks on the subscriber's website (take tour), I was able to identify the highest quality preferred stocks that (1) are TRUPS, (2) are issued by Big Banks, (3) have already exceeded their respective call dates and (4) are currently selling for a market price less than $25 per share. The resulting list that you see here (Figure 3, sorted by current price, cheapest first) was provided to subscribers to the CDx3 Notification Service with the July issue of the subscriber's newsletter, CDx3 Research Notes, on Monday, June 28 (to preserve subscription values the trading symbols for these TRUPS has been obscured here). The far right column shows you how adding a capital gain after receiving two years of dividends pushes your Effective Annual Return (EAR) up substantially. For Big Banks that call their TRUPS under the new Financial Reform Bill, these thirteen specific preferred stocks should be among the first to deliver a capital gain to their owners plus earn an average annual dividend yield of 7.8% in the meantime. New Traditional Preferred Stocks: As the TRUPS are called, many banks that are currently fully compliant with Tier 1 regulatory requirements will find themselves short and in need of a way to restore their Tier 1 Capital. To restore their Tier 1 Capital, the bank can either issue more common stock shares or new traditional preferred stock shares. It seems much more likely that banks will replace their called TRUPS with new traditional preferred stock shares since issuing new common stock to replace the TRUPS would not only be dilutive, but common stock shareholders vote whereas preferred stock shareholders do not. And we’re talking about a heck of a lot of shares here. Why convert your current non-voting TRUPS shareholders into a huge group of voting common shareholders? TRUPS as their respective call dates arrive in accordance with the transition period requirements of the Collins Amendment and issue a new traditional preferred stock to take their place. 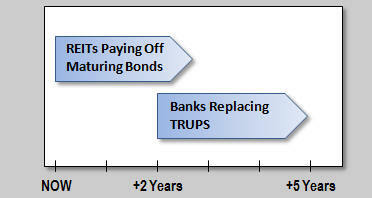 While we cannot say with certainty that these TRUPS will be called (that remains up to the bank), it is not clear why the issuing bank would not seek to do so since the Collins Amendment removes the primary benefit of TRUPS to the bank (boosting Tier 1 Capital) compared to issuing a traditional preferred stock. The coincidental timing of the approaching maturity of a massive volume of REIT corporate bonds and the July 2010 enactment of the Financial Reform Bill should deliver two waves of new, high quality preferred stock issues to preferred stock investors not to mention the capital gain opportunity on bank-issued TRUPS courtesy of the U.S. government. The subscriber's website provides subscribers with the most comprehensive resource available for preferred stock investors, including the CDx3 Discussion Group - the only online forum just for preferred stock investors. See the testimonial quote at the top of this CDx3 Newsletter and you'll see what I mean! The design of the subscriber's website is a direct result of specific input from subscribers through our Continuous Improvement Program. Take A Tour: The website's Tutorial has several components to it, including a description of the site's features. I have made a copy of the website's feature tutorial available to you. 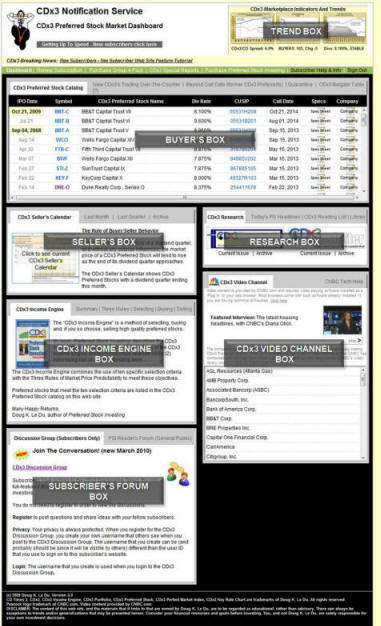 Click on the below link to take a quick tour of the subscriber's website Dashboard. Preferred stock research is very hard to come by. The CDx3 Notification Service is intended for individual investors as well as groups (investing clubs, brokers, families or groups of friends) and all information is provided in plain English for non-experts. If you want to get serious about your preferred stock investments, maybe it's time for you to subscribe to the CDx3 Notification Service too (see reader comments). Effective July 1, 2010 HRPT changed its name to CommonWealth REIT. Along with the name change, the company also changed it trading symbol to CWH from HRP. The symbol change applies to both its common and preferred stock issues. Any common or preferred stock positions you own will be shown with the new symbols in your brokerage account automatically. Standard & Poor's just upgraded their rating on this company to a BUY. CommonWealth is a $1.8 billion Real Estate Investment Trust (REIT) headquartered in Newton, Massachusetts. Unlike many other REITS, CommonWealth does not develop real estate but prefers to acquire properties that are consistent with its strategy of locations with minimal local competition surrounded by land that is already developed for other purposes. During the first quarter of 2010, new lease rents were 2% higher than other leases already in place, largely due to this strategy. CommonWealth's properties are primarily office buildings. Office buildings? With our government leaders continuing to totally ignore dealing with our 10% unemployment rate, who needs more office space, right? So why did Standard & Poor's just upgrade their rating on CommonWealth to a BUY (four out of five stars, June 26, 2010)? Here's a hint: CommonWealth's number one tenant nationwide is the U.S. government; no unemployment problem there. Further, the company owns 32% of another company called Government Properties Income Trust (NYSE: GOV) that focuses on renting just to government tenants. On June 15, 2010 CommonWealth sold $231 million in assets to GOV, the proceeds of which are going to retire a big chunk of CWH's maturing debt. Over the years, CommonWealth's growth-through-acquisition strategy has allowed them to build many subsidiaries then spin them off as publicly-traded companies earning the company substantial net proceeds. Examples include Senior Housing Properties Trust (SNP, 2005, $150 million); Hospitality Properties Trust (HPT, 2006, $175.3 million); and Government Properties Income Trust (GOV, 2009) mentioned above. Beginning in April 2009, CommonWealth went on another shopping spree, acquiring two office properties for $85.8 million and agreeing to purchase twelve more for $192.9 million. These acquisitions are unique because they are Australian, revealing a new international expansion strategy for CommonWealth. "We think HRP's well diversified office portfolio and long-term land holdings provide a high degree of earnings stability relative to peers in a challenging environment. 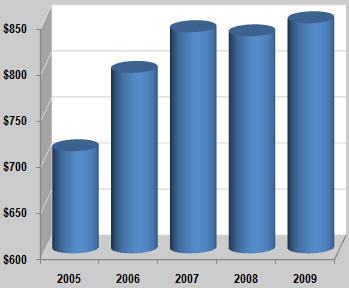 Its financial position is solid, in our view, and the trust effectively managed 2010 debt maturities. We believe HRP will take a more aggressive stance on select acquisition opportunities this year, focusing on attractive valuations in its second tier markets. We also think the 2009 spinoff of government leased properties was a positive step toward unlocking underlying asset value that could be repeated with HRP's industrial holdings. With its recent dividend yield of 6.2%, we would buy HRP for its total return potential." Learn more about CommonWealth REIT: Company website | Profile | Upgrades/Downgrades | Recent News. NOTE: Because of the name and symbol change on July 1, 2010, the above information links may take several days to become populated with the indicated information. If the indication information is not available, please check back later. When a preferred stock is 'called' how much do I get paid per share? This question is particularly important this month since it is at the heart of the opportunity that the Collins Amendment to the new Financial Reform Bill appears to create for preferred stock investors. When a new preferred stock is introduced to the marketplace it typically has a five year "call date." The call date is when the issuing company of a preferred stock regains the right to buy your shares back from you. Until the call date, the issuing company is obligated to pay dividends to you every quarter. The call date introduces several benefits for preferred stock investors. You know in advance what your dividend income is going to be at least until the call date arrives. Plus, for fixed-rate preferred stocks, if rates go down the issuing company is stuck with paying you the higher rate that the preferred stock carries (called the "coupon rate"). But this cuts both ways of course; if rates go up, the dividend income that you receive from a fixed-rate preferred stock does not change. If rates go down, the issuing company will generally be anxious to issue a new preferred stock at the lower rate and use the proceeds to call (buy back from you) the shares of the older, higher-paying issue. Why continue paying out the higher dividend expense when you can issue a new, lower-rate preferred stock and save? In fact, research presented in chapter 14 of Preferred Stock Investing concludes that if the issuing company can save a mere .375% by issuing a new, lower-rate preferred stock and using the proceeds to call an older, higher-rate issue, they will do so 91% of the time. Another advantage to preferred stock investors is that when a company calls (buys back from you) a preferred stock issue, they pay all of the then-current shareholders a fixed price per share that is known in advance. That means that if you can purchase your shares for less than this amount, you also stand to make a capital gain on top of the dividend income that you've been earning in the meantime in the event of a call. The question this month for preferred stock investors: When a preferred stock is called, how much does the issuing company pay you per share? (A) The then-current market price of the preferred stock shares. (C) Your original purchase price (i.e. you get your principal back). 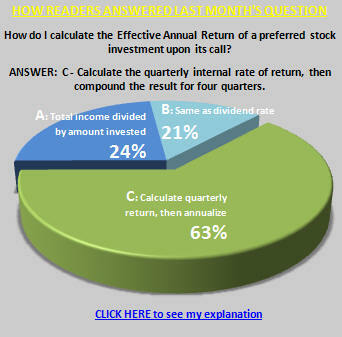 The correct answer to this question is (B), $25.00 per share. 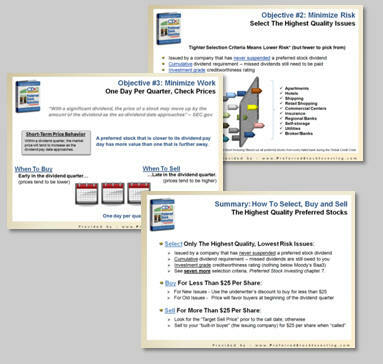 It is for this reason that those following the preferred stock investing method described throughout my book, Preferred Stock Investing, always make their purchases for less than $25 per share. Preferred Stock Investing explains how and when to do so regardless of market conditions. By always purchasing your preferred stock shares for less than $25 each, you set yourself up for a capital gain in the event of a call by the issuing company on top of the great dividend income that you'll be earning in the meantime. Since the Collins Amendment to the new Financial Reform Bill is going to disallow Trust Preferred Stocks (one of the three types of preferred stocks, see Preferred Stock Investing chapter 2) from being included in the capital reserves that Big Banks have to keep on hand (as measure by the Tier 1 Capital calculation), it is extremely likely that these banks are going to be calling their Trust Preferred Stocks as their respective call dates arrive (paying all holders $25 per share). The Collins Amendment specifies this disallowance to begin two years from now, so Big Bank Trust Preferred Stocks that are callable at that time, plus those that become callable thereafter, are highly likely to be called. Knowing that (1) you are going to receive $25.00 per share in the event of a call, (2) a call is now extremely likely, (3) which specific preferred stocks are going to be involved and (4) the exact date that those preferred stocks will become callable, provides a very unique opportunity that preferred stock investors should consider, especially since many of these targeted Trust Preferred Stocks are currently selling for a market price of less than $25 per share with annual dividend yields of about 8%. Never before have preferred stock investors known so much about a specific opportunity, and known it so far in advance and with so much certainly. It is really important that you understand this. This is the most important legislation to come along for preferred stock investors in quite some time. 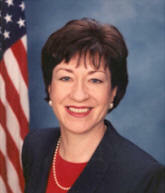 While there are never any guarantees (we are, after all, talking about tasks performed by politicians during an election year), the Collins Amendment to the Financial Reform Bill should lead directly to our Big Banks replacing their currently-trading Trust Preferred Stocks with, in many cases, traditional preferred stocks, while paying you at least two year's worth of great dividend income in the meantime. See the Last Month's CDx3 Investor Results article above for full details. Also important was the Federal Reserve's June 23, 2010 confirmation that they have no intention of raising the federal funds rate for "an extended period." This is good news for preferred stock investors who are holding large but unrealized capital gains as a result of bargain basement purchases made during the Global Credit Crisis. As preferred stock prices have largely returned to their pre-crisis levels, many preferred stock investors are now sitting on huge gains. Since preferred stock prices tend to move inversely to interest rates, those sitting on these gains will continue to see great selling opportunities as long as the Fed delays raising rates. Analysts are now saying that it will likely be well into 2011 before the Fed begins increasing the federal funds rate. Great news for preferred stock sellers sitting on big crisis-era gains. The highest quality preferred stocks are currently yielding in the 7% to 8% range; prices are stable with many great issues selling for less than $25 per share and the Financial Reform Bill should be signed into law during early July. It's a great time to be an investor in the highest quality preferred stocks - "CDx3 Preferred Stocks."